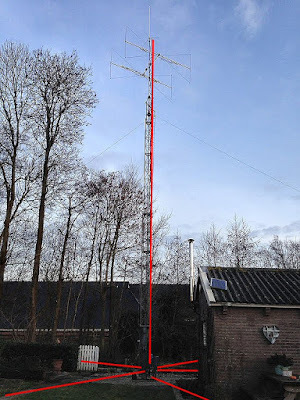 In a quest to get my signal to south america and to have a second all band HF antenna for the PACC contest the idea was to make a vertical antenna and to use the autotuner at the base, a few radials and 15m wire aside the tower to the top. I've been busy with that last weekend but am not satisfied. Have 15m wire connected to the tuner and 5 15m radials at the bottom. However even on DX it is still 1-3dB worse compared to my 2x20m inverted-V fed with open line. I hoped for some more gain on DX but I think a vertical has to stand free from iron obstacles and that is not the case here. Not only my tower is iron but so is my glasshouse construction and my garage roof surrounding my "vertical". 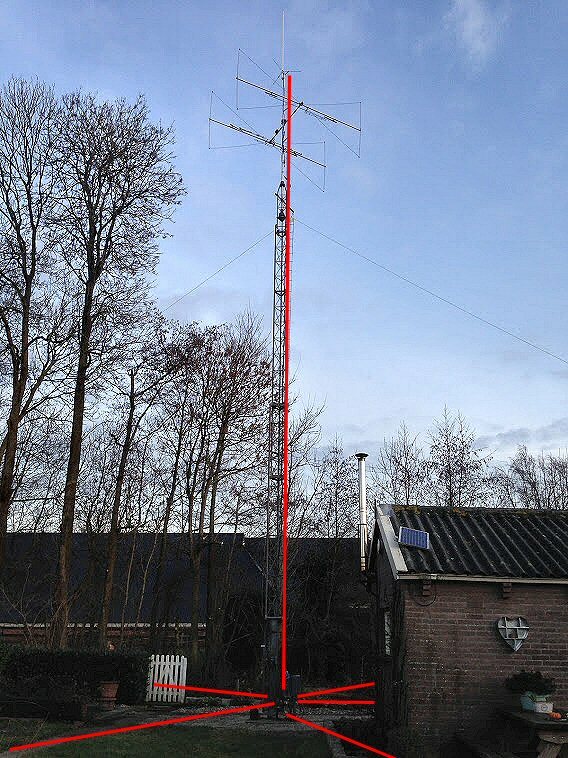 In the past I used my 7,5m long vertical with 3 elevated radials and the same antennatuner on 9m above the ground, it was "looking" over the garage & glasshouse. After all it worked pretty well for 10 years! I've been thinking of mounting that 7,5m vertical on top of the tower. However, I need radials and not the mast as counterpoise. And I need the autotuner to be mounted at the top of the mast, it is possible but not a winter job. I've also been thinking about a gammamatch to connect the tower as vertical, it is an option but only for one band (or you have to switch between several gamma matches). I might try to do that just for 60m but doubt it will be better as the wire aside the tower? Anyone has a better idea? Denk dat het niks uitmaakt of het nu 30cm is of 1m. Dat is maar een fractie verschil voor de 160m of 80 of 60m band. Better yet, hang it from one of those trees to the left side of the photo. Why not try a half sloper? 1/4 wave at lowest desired frequency, with the missing half provided by a very short connection to the tower metalwork with a jubilee clip. This has worked extremely well for me from 30-60m. It's less successful, but usable, on 80m. With a beam on top, you should find matching reasonably easy.